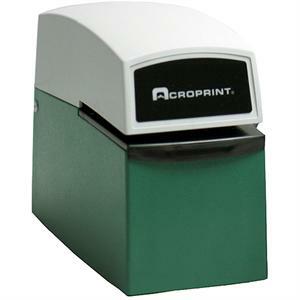 The Acroprint ET is a heavy-duty mechanical time stamp with no digital display. It is designed to print on documents quickly and can penetrate mulitple copies. Its automatic print mechanism allows for convenient one-handed operation. Use it to print year, month, date and time on important documents such as mail, purchae orders, and shipping/receiving documents. With the addition of options upper and/or lower engraved die plates you can customize your stamp for your needs.